This chart clarifies the Lumbar Circle. 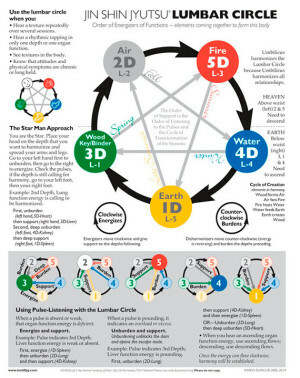 It shows the relationships between the depths in an easy-to-comprehend format and clearly explains, with directions and examples, when and how to use the lumbar circle in your sessions. I was introduced to the Lumber Circle in my first JSJ 5-Day Seminar. However, it took several 5-day classes before I began to comprehend what the Lumbar Circle was all about. This chart is a culmination of what I’ve learned in various classes, with various teachers, one-on-one correspondence with a teacher, a personal review of the JSJ texts and class notes, as well as my study of the 5-Element Theory of Traditional Chinese Medicine. Lumbar Circle Chart © copyright 2014, Karen Searls. All rights reserved. The Lumbar Circle Chart is for your personal use and does not come with distribution rights. No part of this chart may be reproduced, stored in a retrievable system, or transmitted in any form or by any means – electronically, mechanical, photocopying, recording, or otherwise – without written permission of the copyright holder.